Our new flight booking app is live! Instantly check availability, pricing, and book online anytime. Our latest flight booking web application is now live on our website. This new version makes it easier for you to instantly check availability, pricing, and book an on-demand charter flight in our Cirrus SR22. Fly to anywhere in Florida, the Southeast USA or beyond. Give it a try. No login is required to use our web application until you book a trip. Book on your phone, tablet, or desktop. 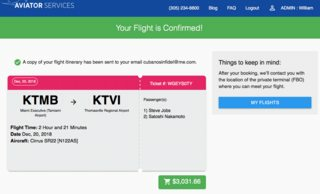 You can book a flight on your computer or mobile device. It’s optimized for both and gives you the ability to check different travel options such as dates, times, or airports without having to call or email us requesting a quote. Plus, you can book your flight online. No need to call us, unless, of course, you have questions or special requests. Save time. Fly on-demand. Use our app to consider business or personal trips. Time savings, efficiency, and convenience of private on-demand air travel is now in your hands. Use our app to consider trips for your business, family or whatever. Keep in mind Florida has over 125 airports, only 19 are served by airlines. The entire Southeast USA is within your reach anytime. Follow us on social links below for deals and updates. We’re continuing to develop this application to include other aircraft. Please continue to follow us on social media (below), blog or email for special deals and updates. Your experience in using our web application is important to us. Please tell us what you think. descriptionCharter plane Miami to Daytona Beach, faster than airlines. descriptionThe US charter aircraft fleet is big. But not so easy to find. 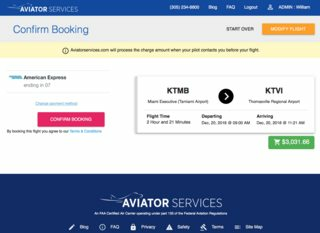 Where is Aviator Services located? We're based in Miami, Florida, at the Miami Executive Airport (formerly known as the Tamiami Airport (TMB)). We're located about forty-five minutes from South Beach and near Kendall, Coral Gables, and Pinecrest. We fly to all cities in Florida and the Southeast USA from our Miami base. Although, our aircraft (Cirrus SR22) is capable of flying to anywhere in the United States, our aircraft is most efficient at distances within 500 miles. We do not offer service to the Bahamas in our Cirrus SR22 due to FAA restrictions for single-engine aircraft flying over water (beyond gliding distance to land). We fly the technically advanced Cirrus SR22 aircraft. The plane with the parachute. It's like flying in a luxury car with wings. It's fast, comfortable, air-conditioned (Florida summers are hot), and has satellite radio with Bose headphones for you to enjoy quiet entertainment. Generaly we can carry up to 600 lbs (272 Kilos) of passengers and bags. We can often carry more depending on the length of your flight. Our normal hours of operation are 7AM to 7PM daily but we do, of course, fly outside these normal hours if your trip requires it. During our normal business hours, though, we are available for short notice flights. Do you have larger aircraft? If you have more than three passengers or otherwise require a larger plane for your trip we can arrange this for you through one of our network operators. We work with several other local aircraft charter operators with a full range of aircraft and experienced crews. We accept credit cards, cash, checks and Bitcoin for payment. We require full payment in advance of your flight unless you have a business account with us. Do you arrange ground transportation? We can arrange for rental cars, car service, or taxi at your destination so you can be on your way soon after you arrive. Let us know when you reserve your flight if you require ground transportation at your destination. Also, we arrange transfers to or from airline terminals if you are departing on or returning from an airline flight. We do this often at Miami International Airport. Please advise us of any special request you may have about your flight. Some customers ask us to overfly a landmark to take pictures or if a specific person can sit next to the pilot during flight. Please ask and we'll make every effort to satisfy your request.